This book chronicles—through the eyes of a range of visitors—the first quarter century of the development of Columbus, Georgia. A planned city located at the head of navigation on the Chattahoochee River, the city underwent a remarkably swift transformation from isolated frontier town to Deep South commercial hub between its founding in 1828 and the eve of the Civil War. Many historians have drawn on the rich archive of documents that help us understand antebellum Columbus and its colorful past from the perspective of residents, but few have attempted to provide the fresh insight of those visitors from America and abroad not familiar with the inner workings of the city. 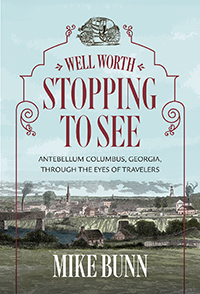 Through an overview narrative history of Columbus’s early years, dozens of rare images, and an assemblage of over fifteen intriguing, candid, at times humorous visitor accounts, “Well Worth Stopping to See” provides a unique and insightful perspective on an influential and dynamic Southern town. Also included is a driving tour of historic sites that will enable readers to appreciate the town’s robust antebellum architectural heritage and better understand the contours of life within the borders of the original city carved from the wilderness nearly two centuries ago.